The C isupper function is one of the Standard Library Function available in C language, which is used to check the given character is an uppercase alphabet or not. In this article we will show you, How to use isupper in C Programming language with example. Before we get into the example, the basic syntax of the isupper in C programming language is as shown below. Below function will accept single character as the parameter, and find whether the given character is in uppercase or not. The isupper function is used to find whether the given character is an uppercase character or not. This C program allows the user to enter any character, and check whether the character is between A to Z using the isupper function. 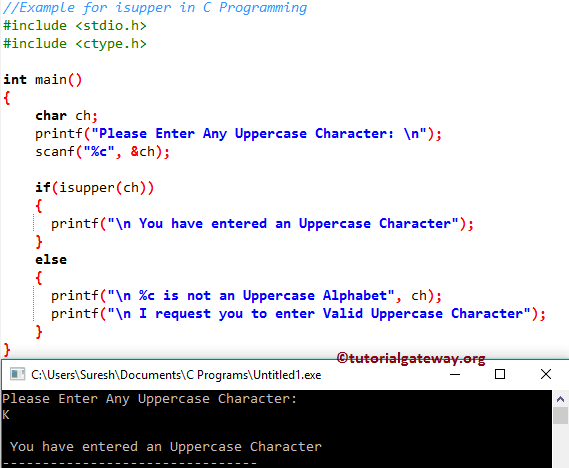 TIP: Please refer C Program to check whether the Character is Uppercase or Not article to understand, How to check whether the character is an uppercase alphabet or not without using the isupper function.